Barcelona striker Luis Suarez reportedly picked up an ankle injury after his side’s win over Real Betis in La Liga yesterday. 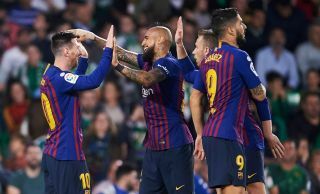 The Uruguay international scored a superb solo goal against Betis and also beautifully set up one for Lionel Messi in the first half. However, Manchester United may want to take note of the fact that Suarez also picked up an injury that means he’s set to sit out international duty with Uruguay over the upcoming break, according to Goal. With the former Liverpool forward playing like this, Man Utd will be desperate not to come up against him in their upcoming Champions League clashes next month. The Red Devils host Barca at Old Trafford on April 10th and travel for the return leg at the Nou Camp six days later. It is not yet entirely clear how serious this Suarez injury is, so the 32-year-old may well be back in action by then. Still, United fans will no doubt be keeping an eye on how Barcelona players are doing fitness-wise ahead of their big game in the Champions League quarter-finals.